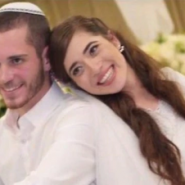 Yesterday (Tuesday) newlyweds, Shira and Amichai Ish Ran, saw each other for the first time since Sunday’s terror attack. Amichai was brought by wheelchair into the ICU to visit his wife of 9 months holding a bouquet of flowers. B”H, Shira’s condition improved dramatically yesterday. B”H, she can now breathe on her own and even speak. Shira and Amichai’s baby, born in his 7th month, is still fighting for his life. We are davening for your healing! !